Backing up your data to prevent loss in the case of digital disaster couldn't be much easier, but there are choices to make, and things you should to to guarantee safety. AppleInsider looks at some of your options, and helps you choose. This is a showdown between four of the best backup utilities and there will be a winner. However, the winner isn't going to be one of these, it's going to be you. We're not looking for app we can crown the best and walk away for a year, we're looking for the very best app for you and exactly what you need to do. Any of these would do the job —but there is one that is better at it for you than either of the others. That said, there is a different one that's better for your friend, colleague, partner, spouse, or relative. Let AppleInsider save you time picking from one of these four. If you're not backing up your data, you really should be. Backups are too important to postpone and the whole issue is too crucial to treat this as a software beauty pageant. So we're urging you use a backup app routinely, and we're recommending that it be one of these: Time Machine, ChronoSync, SuperDuper! or Carbon Copy Cloner. The first is from Apple and you already have it installed on your Mac. All four are fully compatible with macOS Sierra. Despite the commonalities, there is still a reasonable ramp up in features, power and complexity when you go through them in a certain order. Each one can be used for simple tasks and each one can be made more complex through your choice of options and settings. In rough order, simplest to most complex, the order is Time Machine, SuperDuper!, Carbon Copy Cloner and ChronoSync. Read this until you find the one that sounds the best for you and then go read the detailed AppleInsider review of that specific app. When you're done, however, come back for a final section on the part of backing up that we know you've forgotten - because everybody does. In every possible way, Time Machine is the easiest backup system to use. It's even the easiest to get since it's already waiting there on your Mac. The sole extra thing you need is an external hard drive, the same as you do for all of these backup systems. When you plug a drive in and go to format it, your Mac will even prompt you to use it as a Time Machine volume. If you decide to, that's pretty much it - job done. Your Mac will regularly back itself up to that external drive. You can go further and say when you want that regular backup to happen, plus you can choose what actually gets backed up. 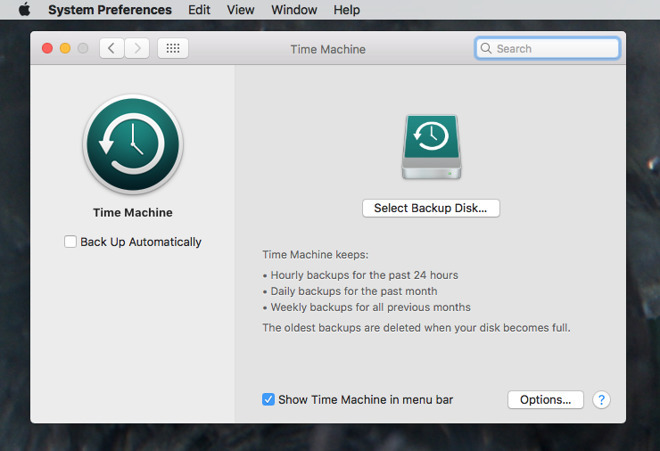 There are far fewer options you can set compared to any of the other backup apps here but Time Machine is meant for you to fire and forget. It's meant to be that you never have to think about it again until you lose a document and want to get it back. So, that could be the end of this entire comparison showdown. It could be that Time Machine is the right one for you. It's so possible that actually we'd say use Time Machine even if you buy another backup app as well. We just say that you should definitely buy another one. Time Machine is remarkable for what it does and that it is built right into your Mac, but it has problems. The most immediately obvious one is that it is notably slower at backing up than any of these other apps. Compounding that, it has no tools to check that the Time Machine backup drive is healthy. We'll put up with a bit of slowness if it means our data is safe, and we'll use multiple Time Machine backups across different drives so we'll cope if one goes wrong. But, what makes us so certain that you need an alternative is this seemingly small point. Time Machine is built to be a backup of your data, not your hard drive. As such, a restoration from Time Machine can take time. With all of the others, you can have these apps create an exact, bootable, clone of your Mac's hard drive. It is like having an extra thorough backup that copies off every single possible thing that is on your drive, but it's much more useful than that. Say your Mac gets stolen or otherwise croaks, but, being the wise owner you are, you've got backup hardware in your garage to keep working. Take a machine out from your stash, plug in the drive that your backup app has prepared, and the new Mac will start up as if it were the old one. All of your same data and applications in the same place, ready to run —immediately. So, we do recommend Time Machine for what it is, and the fact that it's free —but it isn't a complete tool for speedy disaster recovery. SuperDuper! aims to make backing up fast and painless - but also safe. Until you choose to dig deeper, it just asks what you want copied and where you want it copied to. Then before it does any copying, it keeps checking that you're sure this is what you want. 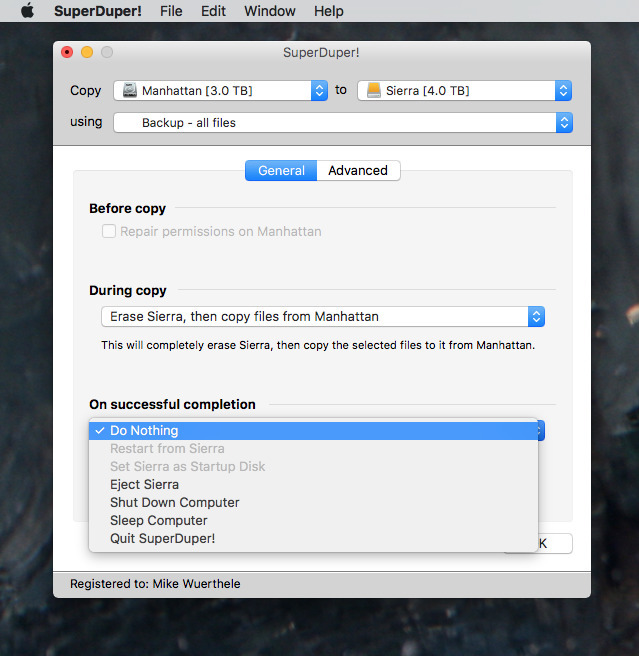 If you want to copy your Mac's Documents folder over to an external hard drive that you've just plugged in, SuperDuper! can be doing that for you in moments. Carbon Copy Cloner looks more complicated than SuperDuper! but a little extra complexity comes greater functionality. Everything that SuperDuper! does, so can Carbon Copy Cloner. What it's latest update has added is the ability to set more backups running. With all of these apps you can say that you want your MacBook Pro hard drive backed up each Friday afternoon. If your MacBook Pro is connected to your external backup drive then on Friday afternoon, each of these apps would start that backup for you. What Carbon Copy Cloner can now do is perform that weekly backup, then when it's due also do a monthly backup to somewhere else. 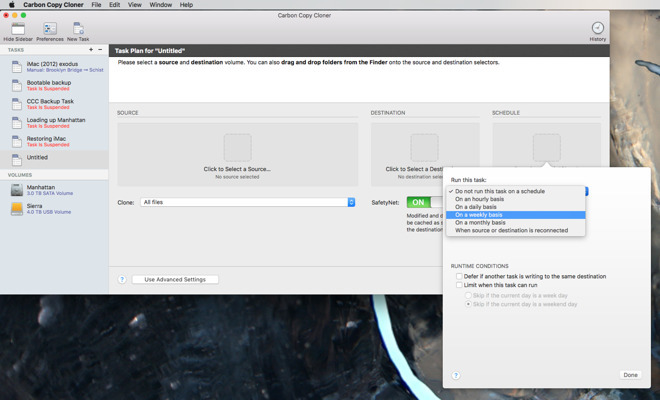 Then it can backup something else to another schedule and to another drive before switching off your Mac for you. That's called task chaining and is a particularly handy addition to the app - once you know exactly what backups you want when. Figure it out, set it up, walk away and never think about it again. Until there's a problem or you think of something while you're out of your office. If that's going to happen to you or you just get so deep into the benefits of backing up multiple things to multiple places, look at ChronoSync. All four of these apps work to achieve what most people need: a safe backup of your work that doesn't require you to keep checking or changing anything. Set them up once and you're done. Except if your work needs rigorous, flexible backing up - or your job is backing up other people's data for them - it's ChronoSync you need. This is not an app that you will buy, launch and be backing up documents in moments. It might take a good minute or two. Thereafter, you could spend your working days exploring the options in ChronoSync. However, there's just one that might make this your right choice. You can control ChronoSync remotely. 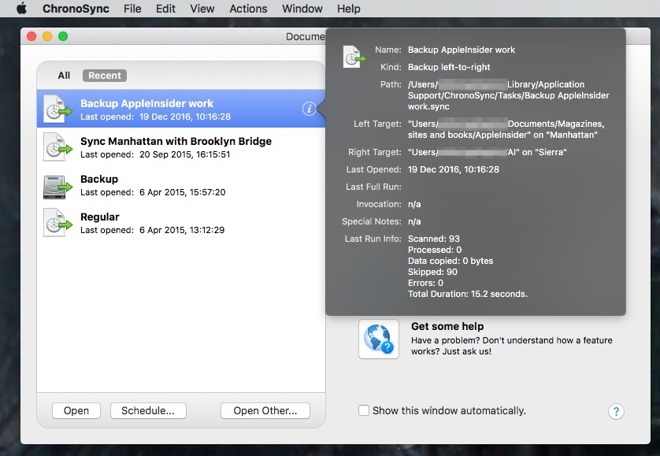 It requires setting up and it requires various companion apps, but you can control your Mac backup from your iPhone. You're the only one who can decide what parts of your work wouldn't be missed if there were a fire. You know which bits would be a royal pain t have to redo. Most importantly of all, you know what documents and what tools would stop your business dead if you lost them. That said, we can tell you two things as certainly as if you'd just briefed us on your plans for the year. One is that anything you create should be backed up, because redoing work doesn't pay and it does keep you from doing something new that does. The other is that you also need to think of your machines. If your business relies entirely on an iMac, the greatest backup in the world won't be a lot of use if the iMac breaks down, and you don't have backup hardware. Look to have a second machine for those times when your main one is out of action for any reason. It doesn't have to be an identical model: just any type of Mac lets you do enough of what you need to cover you until you get your main one back. Next time you upgrade Macs, keep your old one around too. These backup apps, and all others, create archives that you can open on any machine you choose. So if the worst happens and your Mac is broken, with the right decisions on your own backup plan, you could be up and running in minutes with a second machine that has the ability to restore copies of your backup. 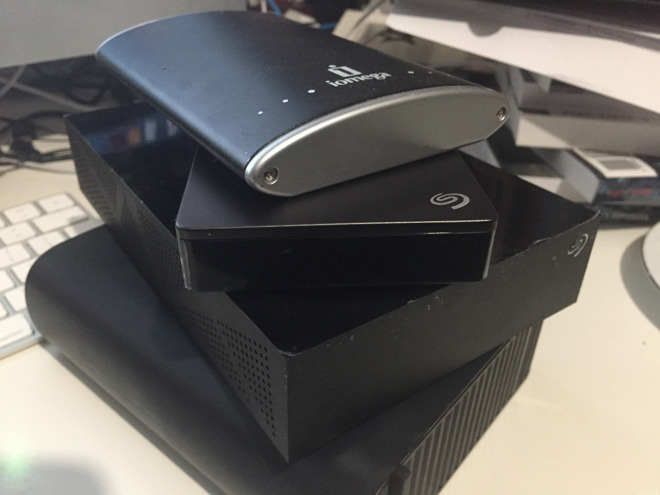 We picked these four backup utilities because of how they work with external hard drives. Maybe you keep one tucked away behind your iMac, maybe you plug one into your MacBook Pro each weekend. Whenever you do it, though, having an external drive and one of these apps is more than good, and basically essential if you earn money from your hardware. Local backup shouldn't be your only option, though. 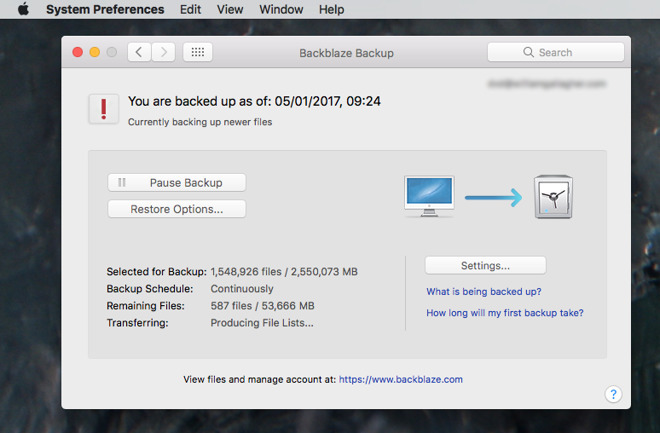 You can use an online backup service such as Backblaze or Crashplan. These use your internet connection to backup your Mac. For a monthly fee of typically around $10, they just keep on backing up everything. It's the ultimate in offsite backups: if someone steals your Mac, or your house burns down, then they could well steal the external hard drive next to it. Nobody can steal your MacBook Pro and also Backblaze or Crashplan's backup of everything. However, they're not practical for getting back all of your data quickly, given the speed of the Internet. They're not practical for creating a clone hard drive. So when your Mac dies, you can't buy a new one and instantly be working again. 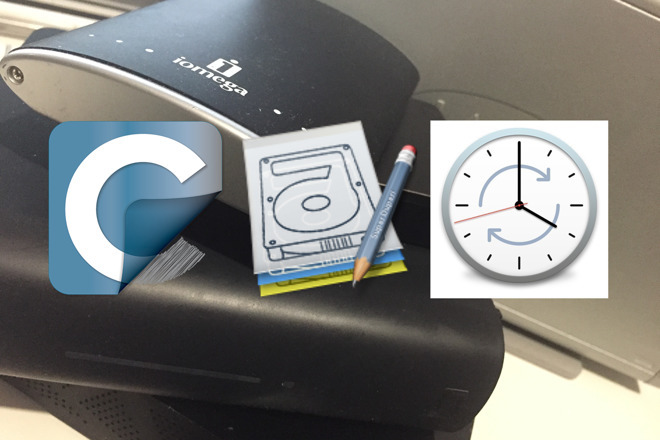 We've recommended that you use Time Machine plus one of the three backup apps we've already spoken about. Let us equally recommend that you use an online backup service or some other method of off-site data warehousing, like keeping a hard drive in a safety deposit box. SuperDuper! 2.9.1 costs $27.95 direct from the manufacturer's site where you can also find a free trial version. It requires macOS 10.8 or later. CarbonCopyCloner costs $39.99 and is available direct from the developer's website where there is also a 30-day free trial. Time Machine is free, and you already have it.